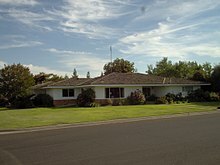 Large custom ranch house built in 1966 in Bakersfield, California. This house exhibits most of the features of the style, note long low profile and large windows. Ranch (also known as; American ranch, California ranch, rambler, or rancher) is a domestic architectural style originating in the United States. The ranch-style house is noted for its long, close-to-the-ground profile, and wide open layout. The house style fused modernist ideas and styles with notions of the American Western period of wide open spaces to create a very informal and casual living style. While the original style of the ranch was very informal and basic in design, starting around the early 1960s, many ranch-style houses constructed in the United States (particularly in the Sun Belt region) were increasingly built with more dramatic features like varying roof lines, cathedral ceilings, sunken living rooms, and extensive landscaping and grounds. First built in the 1920s, the ranch style was extremely popular with the booming post-war middle class of the 1940s to the 1970s. The style is often associated with tract housing built at this time, particularly in the southwest United States, which experienced a population explosion during this period, with a corresponding demand for housing. The style was soon exported to other nations and became popular worldwide. However, their popularity waned in the late 20th century as neo-eclectic house styles, a return to using historical and traditional decoration, became more popular. The raised ranch is a two-story house, in which a finished basement serves as an additional floor. It may be built into a hill to some degree, such that the full size of the house is not evident from the curb. However, it does not become a raised ranch simply by having two floors. For a house to be classified as a raised ranch, there must be a flight of steps to get to the main living floor—if not, it is just a bi-level house. Among real estate agents, this term is commonly misused. The ranch house style was adapted for commercial use during the time of the style's popularity. As the concept of a "drive in" shopping center was being created and popularized, the ranch style was a perfect style to fit into the large tracts of ranch homes being built. Commercial ranch buildings, such as supermarkets and strip malls, typically follow the residential style with simple rustic trim, stucco or board and batten siding, exposed brick and shake roofs, and large windows. The 20th century ranch house style has its roots in North American Spanish colonial architecture of the 17th to 19th century. These buildings used single story floor plans and native materials in a simple style to meet the needs of their inhabitants. Walls were often built of adobe brick and covered with plaster, or more simply used board and batten wood siding. Roofs were low and simple, and usually had wide eaves to help shade the windows from the Southwestern heat. Buildings often had interior courtyards which were surrounded by a U shaped floor plan. Large front porches were also common. These low slung, thick-walled, rustic working ranches were common in the Southwestern states. By the 1950s, the California ranch house, by now often called simply the ranch house or "rambler house", accounted for nine out of every ten new houses. The seemingly endless ability of the style to accommodate the individual needs of the owner/occupant, combined with the very modern inclusion of the latest in building developments and simplicity of the design, satisfied the needs of the time. Ranch houses were built throughout America and were often given regional facelifts to suit regional tastes. The "Colonial Ranch" of the Midwest and Northeast is one such noted variant, adding American Colonial features to the facade of the California ranch house. Ranch houses of the 1940s and 1950s are typically more deliberately themed in nature than those of the 1960s and 1970s, with features such as dovecotes, Swiss board edging on trim, and generally western and even fantasy trim styling. From the mid-1960s onward, the ranch house echoed the national trend towards sleekness in design, with the homes becoming even simpler and more generic as this trend continued. American tastes in architecture began to change in the late 1960s, a move away from Googie and Modernism and ranch houses towards more formal and traditional styles. Builders of ranch houses also began to simplify and cheapen construction of the houses to cut costs, eventually reducing the style down to a very bland and uninteresting house, with little of the charm and drama of the early versions. By the late 1970s, the ranch house was no longer the house of choice, and had been eclipsed by the neo-eclectic styles of the late 20th century. Very late custom ranch houses of the later 1970s begin to exhibit features of the neo-eclectics, such as dramatically elevated rooflines, grand entryways, and traditional detailing. These neo-eclectic houses typically continue many of the lifestyle interior features of the ranch house, such as open floor plans, attached garages, eat-in kitchens, and built-in patios, though their exterior styling typically owes more to northern Europe or Italy or 18th and 19th century house styles than the ranch house. Neo-eclectic houses also have a significant level of formality in their design, both externally and internally, the exact opposite of the typical ranch-style house. Additionally, the increase in land prices has meant a corresponding increase in the number of two-story houses being built, and a shrinking of the size of the average lot; both trends inhibit the traditional ranch house style. Ranch style houses are occasionally still built today, but mainly in the Western states and, usually, as individual custom. Beginning in the late 1990s, a revival of interest in the ranch style house occurred in United States. The renewed interest in the design is mainly focused on existing houses and neighborhoods, not new construction. Younger house buyers find that ranch houses are affordable entry level homes in many markets, and the single story living of the house attracts older buyers looking for a house they can navigate easily as they age. The houses' uniquely American heritage, being an indigenous design, has furthered interest as well. The houses' simplicity and unpretentious nature, in marked contrast to the more dramatic and formal nature of neo-eclectic houses, makes them appealing for some buyers. The more distinctive ranch houses, such as modernist Palmer and Krisel, Joseph Eichler and Cliff May designs, as well as custom houses with a full complement of the style's features, are in particular demand in many markets. Many neighborhoods featuring ranch-style houses are now well-established, with large trees and often with owner modifications that give these sometimes repetitive styles individual character. As these houses were mainly built in the time frame of 1945 to 1970, they are modern in their infrastructure; their heating/cooling systems, wiring, plumbing, windows, doors, and other systems can all be easily repaired and upgraded. Small-scale tract building of ranch houses ended in the late 1970s and early 1980s. Those still built today have usually been individual custom houses. One known exception is a tract of ranch-style houses briefly built on Butte Court in Shafter, California in 2007/08. These houses borrowed their style cues from the 1950s Western styled ranch houses, with board and batten siding, dovecotes, large eaves, and extensive porches. 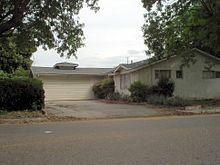 Notably, all houses in this tract were on 1/4-acre lots, and had their front garages turned sideways so that the garage doors were not dominating the front of the house. ^ a b Salant, Katherine (2006-12-30). "The Ranch, an Architectural Archetype Forged on the Frontier". The Washington Post. Retrieved 2010-05-22. ^ Timberg, Scott (October 20, 2005). "The once and future ranch". Los Angeles Times. Allen, B. L. (February 1996). "The Ranch-style House in America: A Cultural and Environmental Discourse". Journal of Architectural Education. 49 (3): 156–165. Bricker, David (1983). "Built For Sale: Cliff May and the Low Cost California Ranch House". M.A. thesis. University of California, Santa Barbara. Bricker, David. "Ranch Houses Are Not All the Same" (PDF). National Park Service Cultural Resources. Clouser, Roger A. (1984). "The Ranch House in America". Ph.D. dissertation. University of Kansas. Hess, Alan (2005). The Ranch House. New York: Harry N. Abrams. ISBN 0-8109-4346-8. Hunter, Christine (1999). Ranches, Rowhouses, and Railroad Flats-- American Homes: How They Shape Our Landscape and Neighborhoods. New York: W.W.Norton. ISBN 0-393-73186-3. May, Cliff (1958). Western Ranch Houses. Santa Monica: Hennessey & Ingalls. McAlester, Virginia & Lee (1997). A Field Guide to American Houses. New York: Knopf. pp. 479–480. ISBN 0-394-73969-8. McCoy, Esther & Evelyn Hitchcock (1983). "The Ranch House". In Moore, Charles W.; et al. Home Sweet Home. Rizzoli. pp. 84–89. Peterson, Gary G. (1989). "Home Off the Range: The Origins and Evolution of Ranch Style Architecture in the United States". Design Methods and Theories. 23 (3): 1040–59. Samon, Katherine Ann (2003). Ranch House Style. New York: Clarkson Potter. ISBN 0-609-60628-X. Wikimedia Commons has media related to Ranch-style architecture.